When I start writing a book, I don’t think about the trope or tropes I’ll use. I just think about the characters. 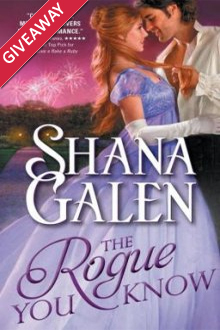 In The Rogue You Know Gideon is a thief and Susanna is the daughter of an earl. Gideon’s charming and worldly, but he wants out of the life he’s been living. Susanna is stiff and sheltered, and she wants out too. These two may seem unlikely to fall in love, but if you know a thing or two about tropes, you’ve probably already figured out why the story works. 1) A second chance at love. I don’t use this trope in The Rogue You Know, but it’s still a favorite of mine. I used it in at least three of my Lord and Lady Spy series books. I like writing about when people meet and fall in love, but sometimes it’s interesting to see what happens when something has gone wrong after the initial love affair. This is another trope I’ve used in several books, including Earls Just Want to Have Fun and The Making of a Duchess. There’s a hint of it in The Rogue You Know as well because the heroine of the story does have a secret she’s not aware of. I wonder if readers will guess it before Susanna does? This is a classic romance trope. All readers love a good enemies-to-lovers story, especially if the love story comes with some lively banter. Susanna and Gideon aren’t exactly enemies, but they’re not friendly at the beginning of the book. In fact, Susanna is blackmailing Gideon. I have used this trope often. Most notably in The Rogue Pirate’s Bride. It’s always fun to throw two people together on a road trip and see what happens. I don’t know about you, but I pretty much want to strangle even my best friend after a few days of traveling together. Gideon and Susanna stay in London, but they have to navigate the dark and dangerous world of the London underground. It’s certainly a new adventure for Susanna and one Gideon would like to survive. This is my favorite trope. I use it in almost every book, and I use it in The Rogue You Know. I love throwing my characters in unfamiliar surroundings and watching what happens. Susanna completely surprised me by her reaction when she’s confronted by a group of thugs intent of abducting Gideon and returning him to a crime lord for the offered reward. Most romances probably rely on one or more tropes. There are so many to choose from! I didn’t even get to mention Opposites Attract, which is certainly a factor when one throws a thief and an upper class lady together as I do in The Rogue You Know. What’s your favorite romance novel, and do you know what trope it uses?